Do you ever have trouble remembering what you can eat during Lent? Growing up, my family never observed Lent, so when I married into a Catholic Family, I really didn’t know what to do or how to participate. Although it all seems pretty simple now, I still remember just how confused and frustrated I was when I was first learning the rules. That’s why I made this handy Lent printable — so anyone who is planning on participating in Lent this year could do so easily, without all the confusion and frustration I felt. Want a printable copy for yourself? It’s free! Just head on over to EquippingGodlyWomen.com and you can have your own printable cheat sheet sent straight to your email inbox! 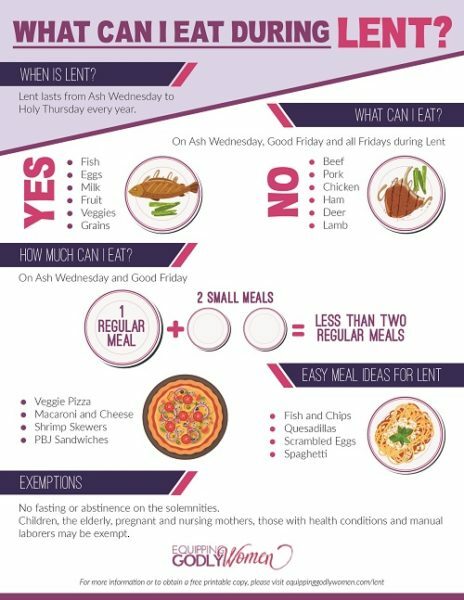 This printable cheat sheet not only has all the Lent rules you need to know – all in one place – but it’s great for printing out and hanging on your refrigerator so you never forget when Friday rolls around. Plus, it even has 8 quick and easy Lent meal ideas for those busy nights when you need to get dinner on the table in a hurry! Grab Your Free Printable Cheat Sheet Here! A devoted Christian, wife and mother, Brittany loves helping other women grow in these roles as well. When she isn’t busy taking care of her growing family, you can find her at Equipping Godly Women, where she regularly shares tips, tricks and encouragement to help Christian women grow in faith and family. Who Is REALLY The Centre of My Universe?